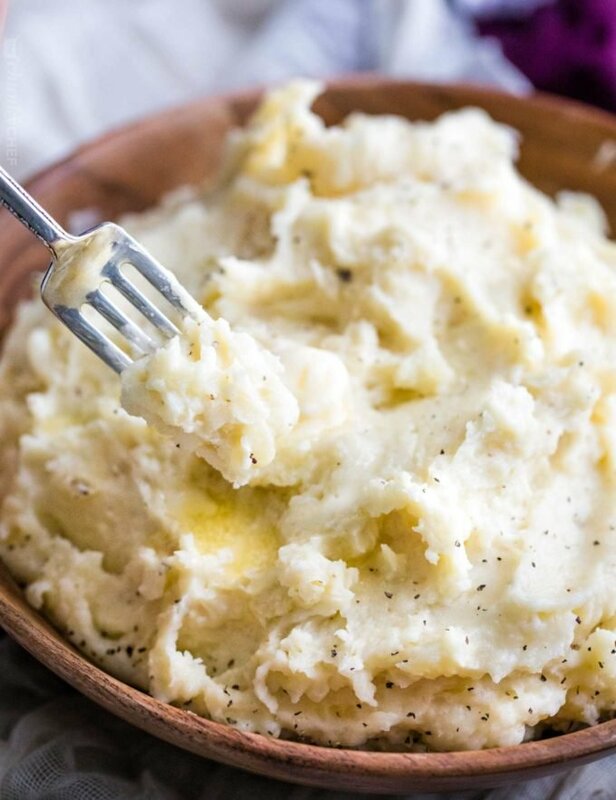 The best, creamy mashed potatoes, made in the slow cooker for the ultimate hassle-free side dish! 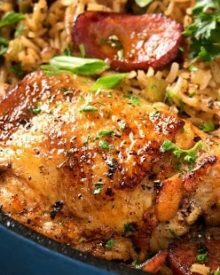 Perfect for Thanksgiving or a busy weeknight! 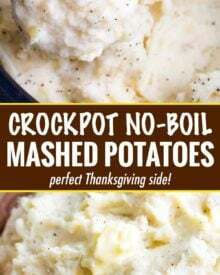 Forget boiling mashed potatoes and taking up precious stove-top space on a busy holiday, let the crockpot do the work for you! This is one of those recipes I’ve been meaning to get up here on the blog for a while now, but I kept working on getting it just right. I know what you’re thinking… it’s mashed potatoes… they’re hard to get wrong. But there’s so many things that can lead to mashed potatoes being just so-so, and not truly the BEST. I’ll dive into some of those things below. Technically it all comes down to personal preference, but my favorites are russets or yukon golds. Beyond them just being my favorite potatoes in general, they’re starchier, which make for very fluffy and smooth mashed potatoes. 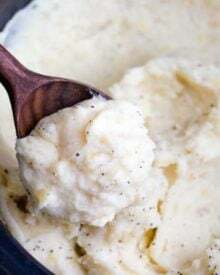 Waxier varieties, like red or white potatoes usually need more mashing to get as creamy, which can sometimes make the mashed potatoes gluey or pasty. Crockpot – add mashed potatoes to slow cooker, cover and cook on LOW for 3 hours, stirring a few times. Right before serving, dollop with a little bit of butter and stir. 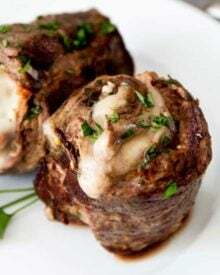 Oven – add mashed potatoes to pan, and bake at 375 for 30-45 minutes, stirring once or twice. Add additional butter or cream if needed before serving. 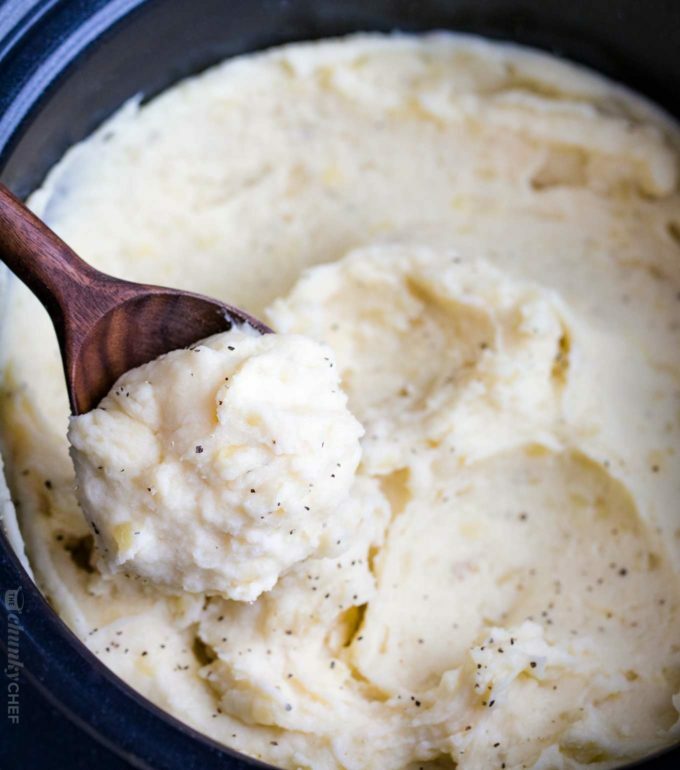 HOW LONG CAN YOU KEEP MASHED POTATOES IN A CROCKPOT? Around 3-4 hours is what I’ve successfully done without the potatoes drying out too much. Plenty of time to last through a hearty holiday meal! HOW MANY POTATOES SHOULD YOU USE PER PERSON FOR MASHED POTATOES? The rule of thumb is around 1/2 lb of potatoes per person. So this recipe uses 5 lbs of potatoes and serves 10 people. If you have huge potato lovers you’ll be serving, you might want to go with 3/4 lb per person. 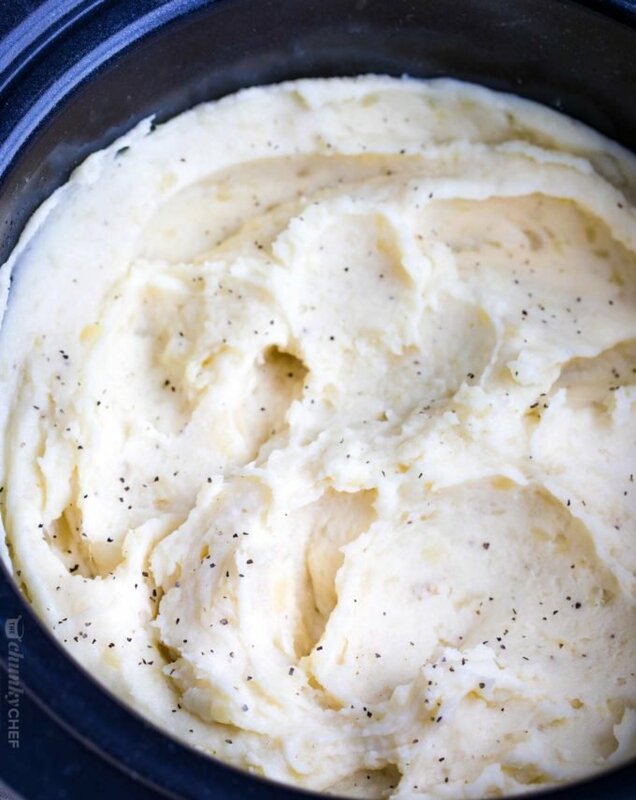 WHAT FLAVORS CAN YOU ADD TO MASHED POTATOES? 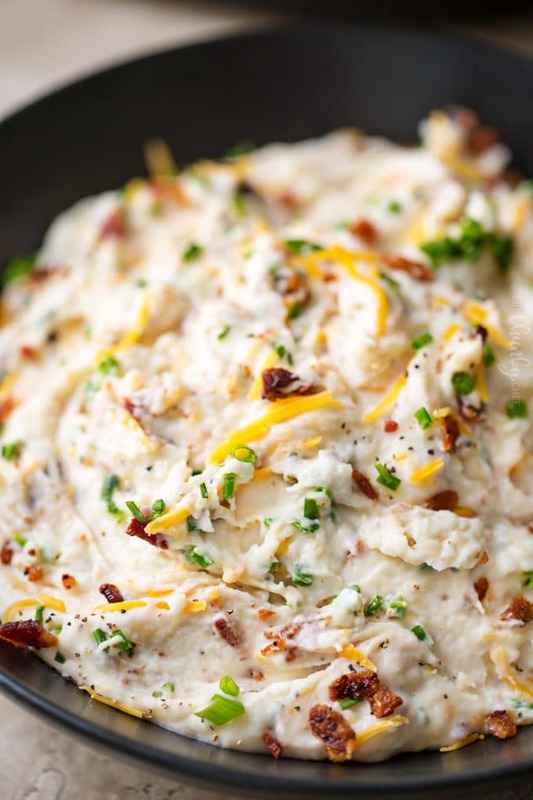 Or go for loaded mashed potatoes with sour cream, cheddar, bacon and chives! WHAT SHOULD YOU SERVE MASHED POTATOES WITH? 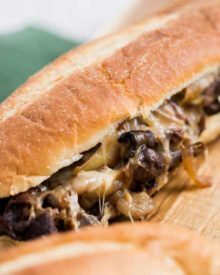 My all-time favorite is my Glazed Chipotle Meatloaf, but lately I’ve been loving this Shredded Italian Beef over mashed potatoes. I also like to serve some Roasted Vegetables or Cheesy Brussesls Sprouts alongside as well. Use starchier potatoes. 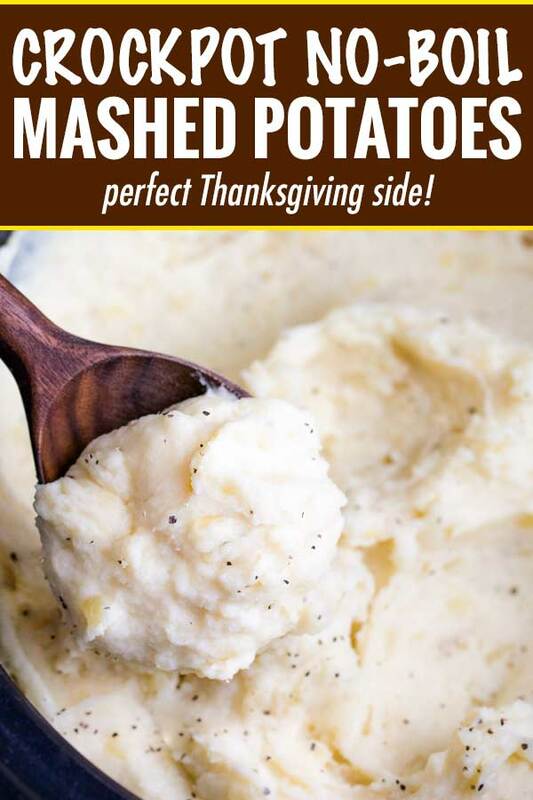 Like I mentioned earlier, they make for the fluffiest and creamiest mashed potatoes. When adding liquids to cooked potatoes (like heavy cream), make sure they’re at least at room temperature, or warmed if you have the time. Adding cold liquids to hot potatoes can cool the potatoes down. Season the potatoes well. A lot of people under-salt their mashed potatoes. Start with 1/2 tsp of kosher salt, then take a quick taste. 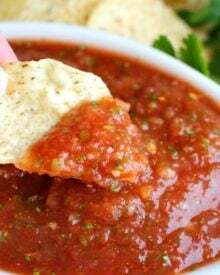 Add more salt, a pinch at a time, tasting in between until they’re just right. When in doubt, ask a family member to take a quick taste too. 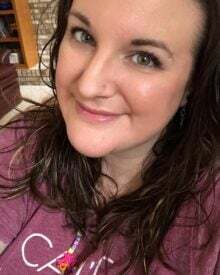 Crockpot – I love this brand, and the fact that it locks down for travel is great if you’re headed somewhere else for the holidays! Potato Masher – I didn’t think I needed a new potato masher until I tried this one.. it’s truly amazing! 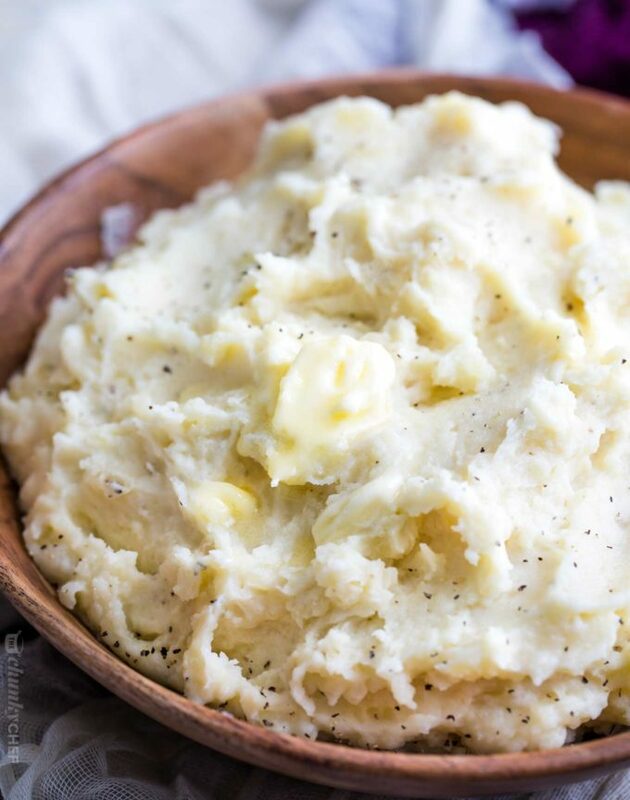 The best, creamy mashed potatoes, made in the slow cooker for the ultimate hassle-free side dish! Grease sides of slow cooker insert lightly with butter, then add chopped potatoes. Top with onion powder and garlic powder, then pour in chicken broth. Cube 1 of the sticks of butter and place cubes around the tops of the potatoes. Cover and cook on HIGH for 3 1/2 - 4 hours. Drain potatoes then place back in the crockpot. Add remaining stick of butter (cubed), cream cheese, heavy cream and salt and pepper. Start with 1/2 tsp of kosher salt and 1/4 tsp pepper and adjust from there. 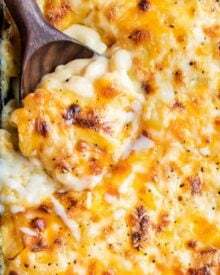 Use a potato masher to mash potatoes until mashed to your desired consistency, using a bit more heavy cream if needed. Serve right away, or cover and set to WARM setting for a few hours. All slow cookers cook a little differently, so to tell if your potatoes are done cooking, open the lid and pierce a potato chunk with a fork. You're looking for the fork to slide into the potato easily. Yukon gold potatoes can be used instead of russets. Waxier potatoes like red or white potatoes have the potential to become a bit gluey when mashed, so use at your discretion. This mashed potato looks SO good! Can’t wait to give this a try! 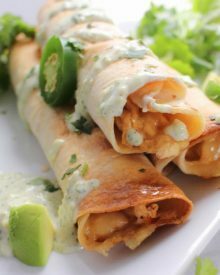 I really need to utilize my slow cooker more, these look wonderful! Looks so yummy! I love how creamy these potatoes are, so excited to try this recipe! These potatoes look so creamy! They would be great for the holidays! 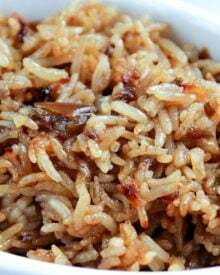 This is so great to still have this must have dish without taking up precious stove top space during holiday cooking! They look so creamy! !